Decatur, Georgia (USA) -- Turn off busy North Decatur Road into a sleepy subdivision of brick 1940s houses, walk up to a stained glass door, and enter the oasis of tranquility that is Pam Wedding's home. "Make yourself comfortable," she greeted. That was easy. 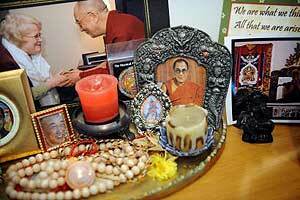 There's something to be said about having a home blessed by four Tibetan Monks. As retired vice president of public affairs for Turner Broadcasting System, Wedding has turned her lifestyle down a notch. Her home reflects the influence of Tibetan Buddhism, even to the untrained eye. In April, she came out of retirement to become project coordinator for the Emory-Tibet Partnership at Emory University. Wedding's journey into Buddhism has influenced every part of her life. It began during the 1996 Olympics, when the TBS executive worked with Oglethorpe University to set up an exhibit of mystical Tibetan art objects, many of which had been packed away since China's Cultural Revolution. Mesmerized by the experience, Wedding was on her way to Tibet just one month later. In her slightly furnished living room is a built-in bookcase filled with hardbacks on Tibetan Buddhism. Another bookcase holds her five Emmy awards, reminders of those deadline-dotted days in TV. Mixed in with "Healing and the Mind," a signed book from Bill Moyers, are books on Buddhist mandalas, labyrinths, art and meditation. There is also a special medallion and a book autographed by the Dalai Lama that Wedding recently received for her volunteer work with the Drepung Loseling Center for Tibetan Buddhism Studies and Practices. Everywhere are clusters of collections she calls sacred spaces. Some are whimsical, reverent or thought provoking. "Wherever I look I am reminded of the things I love," she explained, pointing out a homey grouping of framed prayers from all over the world. "I have little altars everywhere." "One of the things that attracted me to this house was the studio in the back alcove," said Wedding, a former television graphic artist. Her styles have since shifted to portraits, illustrations and greeting cards, and her mermaid collection is inspiration for a book in progress. Two primary objects of her affection are Wedding's grandchildren, preschooler Cayman, and his kindergartener sister, Georgia. Their "Mama Lama" shares her meditation room with them. On one wall is a shrine to Green Tara, a female deity poised for action and healing, with other deities surrounded by prayer beads she has collected over the years. Another wall holds a shrine for the kids, an eclectic collection of statuettes and symbols. Holy water from the Vatican sits next to a ceramic mouse made by Georgia, and nearby is the ceramic rabbit crafted by Georgia's mom. Wedding's collection of Aladdin's lamps is something everyone appreciates. "They remind me of the magic and mystery of all the things we know so little about," said Wedding. "I want to pass on this sense of wonder on to my little ones." Add to the mix a collection of needlepoint pillows, tapestries and paintings by Wedding's long-deceased mother, and see what Wedding's life is all about today. She is a link from Buddhist antiquities into the future, as seen through the eyes of her grandchildren. Cluster, don't clutter. Keep objects of the same theme close together. Use only items that hold personal value. Appreciate. Consider the pleasure that is available by simply gazing at each collection. Feel. Life is about love, laughter, sorrow and awe. Let collections evoke those emotions. Share. Welcome visitors. Telling stories about the objects enriches the total experience.